Mr. PAUL. Mr. Speaker, today I rise and with gratitude to Edmund Burke and paraphrase words he first spoke 224 years ago this week. As it is presently true that to restore liberty and dignity to a nation so great and distracted as ours is indeed a significant undertaking. For, judging of what we are by what we ought to be, I have persuaded myself that this body might accept this reasonable proposition. The proposition is peace. Not peace through the medium of war, not peace to be hunted through the labyrinth of intricate and endless negotiations; not peace to arise out of universal discord, fomented from principle, in all part of the earth; not peace to depend on juridical determination of perplexing questions, or the precise marking the shadowy boundaries of distant nations. It is simply peace, sought in its natural course and in it ordinary haunts. Let other nations always keep the idea of their sovereign self-government associated with our Republic and they will befriend us, and no force under heaven will be of power to tear them from our allegiance. But let it be once understood that our government may be one thing and their sovereignty another, that these two things exist without mutual regard one for the other — and the affinity will be gone, the friendship loosened and the alliance hasten to decay and dissolution. As long as we have the wisdom to keep this country as the sanctuary of liberty, the sacred temple consecrated to our common faith, wherever mankind worships freedom they will turn their faces toward us. The more they multiply, the more friends we will have, the more ardently they love liberty, the more perfect will be our relations. Slavery they can find anywhere, as near to us as Cuba or as remote as China. But until we become lost to all feeling of our national interest and natural legacy, freedom and self-rule they can find in none but the American founding. These are precious commodities, and our nation alone was founded them. This is the true currency which binds to us the commerce of nations and through them secures the wealth of the world. But deny others of their national sovereignty and self-government, and you break that sole bond which originally made, and must still preserve, friendship among nations. Do not entertain so weak an imagination as that UN Charters and Security Councils, GATT and international laws, World Trade Organizations and General Assemblies, are what promote commerce and friendship. Do not dream that NATO and peacekeeping forces are the things that can hold nations together. It is the spirit of community that gives nations their lives and efficacy. And it is the spirit of the constitution of our founders that can invigorate every nation of the world, even down to the minutest of these. For is it not the same virtue which would do the thing for us here in these United States? Do you imagine than that it is the Income Tax which pays our revenue? That it is the annual vote of the Ways and Means Committee, which provide us an army? Or that it is the Court Martial which inspires it with bravery and discipline? No! Surely, no! It is the private activity of citizens which gives government revenue, and it is the defense of our country that encourages young people to not only populate our army and navy but also has infused them with a patriotism without which our army will become a base rubble and our navy nothing but rotten timber. All this, I know well enough, will sound wild and chimerical to the profane herd of those vulgar and mechanical politicians who have no place among us: a sort of people who think that nothing exists but what is gross and material, and who, therefore, far from begin qualified to be directors of the great movement of this nation, are not fit to turn a wheel in the machinery of our government. But to men truly initiated and rightly taught, these ruling and master principles, which in the opinion of such men as I have mentioned have no substantial existence, are in truth everything. Magnanimity in politics is often the truest wisdom, and a great nation and little minds go ill together. If we are conscious of our situation, and work zealously to fill our places as becomes the history of this great institution, we ought to auspiciate all our public proceedings on Kosovo with the old warning of the Church, Sursum corda! We ought to elevate our minds to the greatness of that trust to which the order of Providence has called us. By adverting to the dignity of this high calling, our forefathers turned a savage wilderness into a glorious nation, and have made the most extensive and the only honorable conquests, not by bombing and sabre-rattling, but by promoting the wealth, the liberty, and the peace of mankind. Let us gain our allies as we obtain our own liberty. Respect of self-government has made our nation all that it is, peace and neutrality alone will makes ours the Republic that it can yet still be. This chapter was inserted into the Extensions of Remarks section of the Congressional Record and was never actually delivered on the House floor. Ron Paul cites a speech made by Edmund Burke, 19 April 1774 which can be found at http://www.gutenberg.org/files/15198/15198-8.txt where it says, SPEECH ON MOVING HIS RESOLUTIONS FOR CONCILIATION WITH THE COLONIES. MARCH 22, 1775. or at http://RonPaulQuotes.com/15198-8.txt. 1999 Ron Paul 23:2 Ungrammatical or the precise marking the shadowy boundaries of distant nations. probably should be or the precise marking of the shadowy boundaries of distant nations. 1999 Ron Paul 23:2 in all part of the earth probably should be plural: in all parts of the earth. 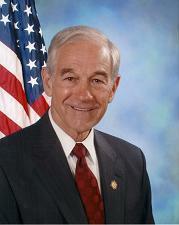 1999 Ron Paul 23:2 It is simply peace, sought in its natural course and in it ordinary haunts. probably should be It is simply peace, sought in its natural course and in its ordinary haunts. 1999 Ron Paul 23:4 Do you imagine than that it is the Income Tax which pays our revenue? probably should be Do you imagine then that it is the Income Tax which pays our revenue?